Corporations can make heroic efforts to operate more sustainably without sacrifice to profit. Bruce Wayne, the billionaire alter ego of Batman, seems to think they can. DC Comics entered brand new territory last year with the launch of an eight-issue series called Batman Incorporated: Leviathan Strikes. It seems Mr. Wayne, the shrewd businessman he is, figured out that Batman – the advanced technologies he uses, the skills he has developed and the symbol itself – should be the heart of a global corporate franchise. By helping others become caped crusaders, the crusader in pinstripes can also help make the world a better place. A work of fiction, yes, but the thought of corporations as superheroes – rather than greed-driven villains of commerce – has some appeal in the environmentally and socially challenged society we have created, given the unwillingness of our political leaders to don the cape and red tights. The idea may sound silly. Indeed, using the word superhero is a tremendous stretch. 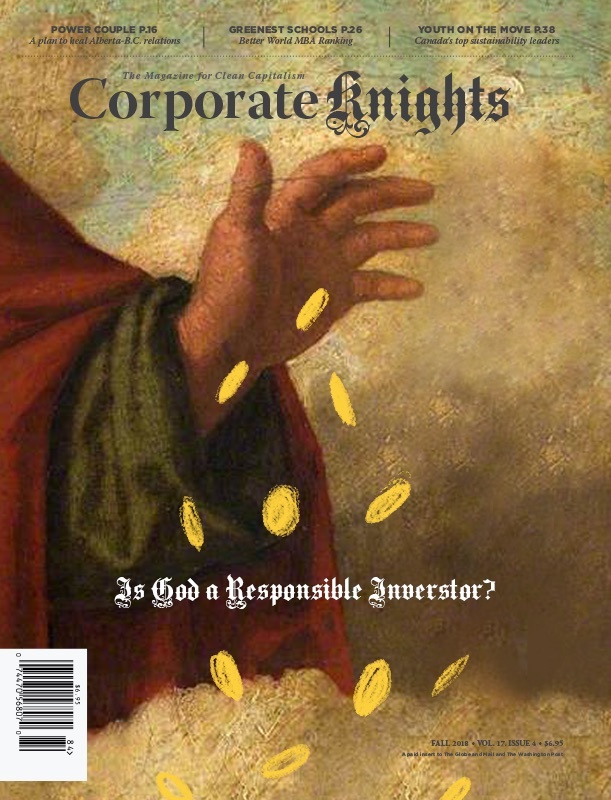 But Corporate Knights’ Global 100 ranking of the world’s most sustainable companies is about as close as one can get to identifying corporations making a big, in some cases heroic, effort to think long term and link profit-making to responsible behaviour. With collective revenue of about $3.1 trillion (roughly 4.5 per cent of global GDP) and a workforce of nearly 5.3 million, the Global 100 companies – representing 22 countries on six continents – are setting a higher standard that will pressure others to follow. Take Belgium-based materials company Umicore, which this year ranked No. 1 on our annual Global 100. As contributor Marc Gunther writes here, Umicore began to reinvent itself nearly two decades ago to take advantage of four global megatrends: resource scarcity, electrified transportation, clean energy production and storage, and cleaner air. Once primarily a mining company, it now recycles what has already been mined and creates value-added products, both reducing costs and environmental impacts. Whether by default or design, corporations on the Global 100 continue to raise the bar on what it means to be a clean capitalism leader. For example, the number of companies that link executive compensation to sustainability goals more than doubled over last year, to 54 from 26. In most of the sectors we cover, energy, water and waste productivity improved across the board, as did reduction in greenhouse gas emissions relative to revenue generation. The employee turnover rate, an indicator of worker happiness, also improved. Turnover was 11.4 per cent on average in 2012, but fell to 9 per cent on this year’s ranking. There are also slightly more women entering the mix on boards of directors, particularly in the information technology, consumer discretionary and consumer staples sectors. A 46 per cent company turnover rate on the Global 100 tells us that leadership isn’t just confined to the same group of corporations every year. Newcomers are challenging the early leaders as more companies are coming to realize the bottom-line benefits of using resources more efficiently, treating employees with respect, and being meaningful contributors to the communities they rely on. The United States and Canada (with one-tenth the population of the U.S.) tied to claim the most companies on the Global 100, with a total of 10 each. Britain, France and Australia followed with nine to round out the Top 5. While Canada’s performance was impressive relative to the United States, Australia had the strongest presence per capita. “That the U.S. and Canada each contributed 10 sustainability leaders is a strong indication that, despite the absence in each country of regulations on environmental and social performance, more companies are taking sustainability very seriously,” said Michael Yow, lead analyst at CK Capital, the research division of Corporate Knights. Are the Global 100 companies on a sustainable path? CK has calculated that a company’s resource productivity would have to improve at a compound annual growth rate (CAGR) of 6 per cent to achieve a doubling in productivity by 2025 and a quadrupling by 2037. As relates to improvement in energy productivity between 2009 and 2011, 70 per cent of companies are on that sustainable path, while 79 per cent are on a sustainable course for reducing GHG emissions relative to revenues. Performance around water and waste productivity is not as strong, at 51 per cent and 53 per cent respectively. Impressively, 18 companies stood out as achieving 6 per cent CAGR from 2009 to 2011 in each of the four categories. Of course, clean capitalism is a journey, not a destination, and the Global 100 is a reliable but imperfect barometer of corporate performance. It doesn’t, for example, capture individual social and environmental transgressions, or pass judgment on the ethicality of most products and services. But the bar will continue to rise as resource productivity and social responsibility become increasingly crucial to staying competitive in our global economy. There will be setbacks along the way. Pay equity, for example, was down this year for the utility, financials, health care and consumer discretionary sectors. Lost time injury rates hardly changed.